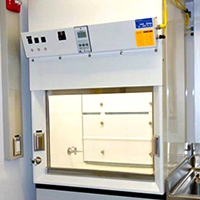 The Laminar Flow Fume Hood combines the features of a vertical laminar flow cleanbench with that of a fume hood. This versatile piece of equipment can solve many difficult and sometimes conflicting air quality requirements. Germfree’s Laminar Flow Fume Hoods allow for the handling of products that must be kept particle free, while effectively keeping hazardous and noxious particulates and gases away from personnel. We offer both HEPA and UPLA filters. Laminar Flow Fume Hoods typically provide ISO 5 / Class 100 air. 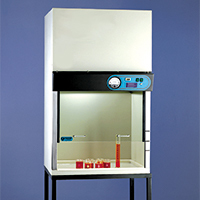 However, we also feature Laminar Flow Fume Hoods that provide up to Class 10 / ISO 4 filtration. 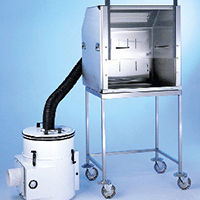 Germfree’s Ductless Fume Hoods provide a practical option for facilities where ducting to the outdoors is impractical. These units offer filtration systems that handle finite quantities of non-explosive solids, liquids, fumes, gases and nanoparticles. Additionally, our Ductless Fume Hoods with HEPA exhaust filtration also function as Class I BSCs (Biological Safety Cabinets). Our Source Capture Systems provide flexible solutions for many applications and are adaptable for use with various lab enclosures. SC units are self-contained and easy to move. These units are utilized to provide filtration of particulates or fumes in laboratories, cleanrooms and other production areas.